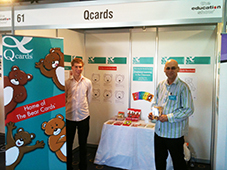 Qcards is a publishing house dedicated to producing card-based games and activities to enhance social and emotional well-being. The “Q” in Qcards represents the personal qualities (or strengths, attributes, abilities) inherent in all of us. The particular mix of qualities we possess is what makes us unique. They help to form our individual personalities and inform our choices in life. Our goal is to assist people to recognise and develop their individual qualities in order to attain their full potential in life. We aim to do this by providing fun and engaging ways to help people explore their inner selves and to develop new insights into achieving and maintaining a sense of personal well-being. Qcards was established by John Veeken. John runs an illustration and graphic design service and, when he gets the chance, creates and exhibits sculptures from rusty barbed wire. Qcards relies on the contributions and expert advice of many talented people. Significant contributors are Sandy Harman, who co-authored the original Bear Cards booklet and provided a wealth of creative ideas, and Marie McNamara who wrote The Values Cards instructions and trialled the prototypes in her role as social worker / counsellor. Qcards trials and evaluates its products and actively seeks feedback from parents, families, teachers, psychologists and social workers prior to publication. If you have any feedback about our products, we’d love to hear from you.